Electromobility and networking are at the focal point of arguably the most important automobile show in the world. It's about the power of the market and the future of the industry. Germany's premium seller has a new trump card: After four years, the Mercedes S-Class gets a facelift and it has been optically and technically revamped. A range of additional systems have been installed to entice the customer. Daimler's flagship model shines with a new bumper and radiator grille. "New cars come from China and that's what the Shanghai motor show proves," says expert Ferdinand Dudenhöffer. The Chinese electric car maker Nio could stand as a symbol for this statement. Launched two years ago as NextEV, the start-up, which combines technology from Silicon Valley and design from Munich, wants to conquer the mass market under a new name. Lynk & Co is a new subsidiary of the Chinese giant Geely and wants to come to Europe in 2018. Lynk & Co doesn't act as a classic car brand, but wants to bring the buying experience into the internet age with a new distribution system, focusing on pure online sales. Just like Tesla has already done. This would be a revolution for the vintage motor trade industry. Volkswagen has also recognized the trend, and the Germans are developing a completely new range of electric vehicles. With the world premiere of the I.D. Crozz brand, the company supplied an important outlook on this concept in Shanghai. This four door is the first electrically-driven mixture of the coupé and SUV brand with production scheduled to start in 2020. Skoda, a subsidiary of the Volkswagen Group, is also showing an electric SUV model for the first time in Shanghai on the MEB's new modular (Modular Electrification Module) platform. Skoda calls it the Studie Vision E and also plans another SUV which can travel up to 500 kilometers (310 miles). Since all good things come in threes, Volkswagen presented its new premium SUV Coupe from Audi which is also based on the MEB Platform. VW Group leader Thomas Sedran recently described the move to the platform as "epochal for VW" - just as the transition from Beetle to Golf. Wang Yongping, president of the US-Chinese manufacturer SAIC-GM, showed off the world premiere of the first Buick-branded limousine with plug-in hybrid drive. In China, as many electric cars are sold as in the rest of the world. Beijing wants to deal with the smog problems in the country's major cities and make China the leading market for eco-friendly driving. 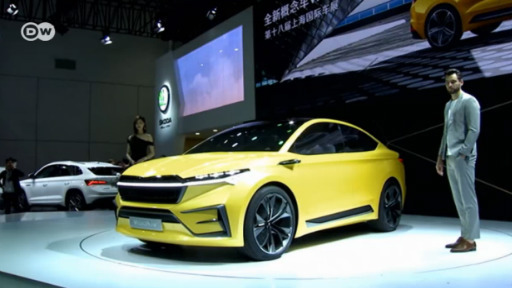 According to estimates, the Chinese car market will increase to nearly 35.5 million passenger car sales by the year 2025, from the current 24 million. From today's perspective, this represents an average annual sales increase of 4.6 percent. This means that one-third of all new car buyers in China will live in China in the year 2025 - in 2005 it was only 6 percent of the global car market.